William Lowth was born in Carlton Scroop in about 1830. We’ve also come across one of his many brothers, Samuel Lowth, working as a carter for Matthew Robinson in Stubton in 1861. In Aug 1852 William married Sarah Matkin (born Lincs in about 1830); however, she died 2 years later, probably after the birth of their daughter Elizabeth Marian (died in infancy). William married again in Fermoy, Ireland in May 1873, to Julia Magner (born Ireland). They had 9 children, the first 2 born in India, the others in Carlton Scroop, where they settled around 1880. The 4th child was James Francis Alexander (born 29 May 1881), the youngest was Harold Ivus (born 1892). In 1901 William was a road labourer and James (19) was an ironstone labourer. James Francis Alexander Lowth enlisted in the Royal Marine Light Infantry in Jul 1904 (service number CH/14721). 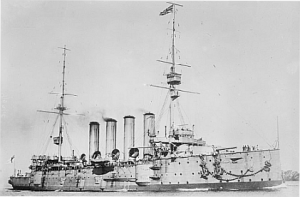 On 22 Sep 1914 he was a Corporal serving onboard the armoured cruiser HMS Aboukir when it was torpedoed off the Dutch coast by German submarine U9. The ship rapidly flooded and most of the surviving crew were forced to jump overboard to escape before the ship sank. Believing that the Aboukir had hit a mine, its fellow cruisers HMS Cressy and HMS Hogue, moved in to pick up survivors. These were also torpedoed and in little over an hour all 3 ships had sunk with the loss of 1459 men. 837 other men were rescued by Dutch merchant ships and British trawlers. James Lowth (age 33) was killed in the action; his body was not recovered for burial. He is commemorated on the Chatham Naval Memorial. His next of kin was his mother, Julia Lowth, then of Mile Cottages, Claypole. Harold Lowth enlisted at Grantham in 1/4th Bttn, the Duke of Wellington’s (West Riding Regt); regimental number 203188. He was resident in Howton, Lincs. He won the military medal in Oct 1917 but died of wounds on 27 Dec 1917 (age 25) at a casualty clearing station at Lijssenthoek near Ypres and was buried in the military cemetery there.